There’s something about America’s most beautiful waterfalls that makes them worth the chase, whether a road trip to a new destination or an overnight hike in one of country’s magnificent national parks. From stunning chutes of water jutting from tropical cliffs to gentle tumbles down the side of a glacier, here are the most beautiful waterfalls in the USA that should definitely make your bucket list. 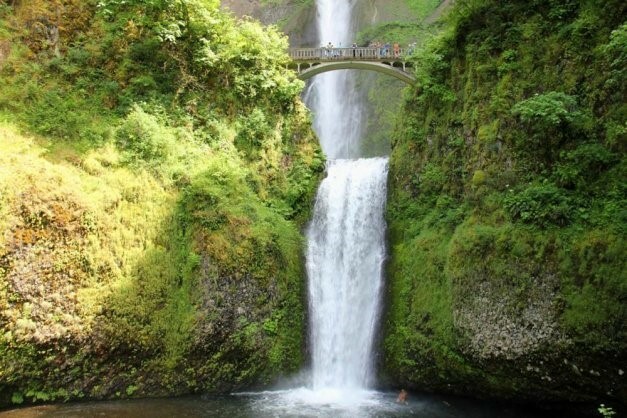 When visiting Portland, Oregon, discover Multnomah Falls and the Columbia River Gorge Waterfalls, the top-ranked attractions in the area, during this guided tour. Travel along the historic Columbia River Highway National Scenic Byway, the first scenic highway in the US to be named a National Historic Landmark. Stop at the magnificent Multnomah Falls, a 611-foot-tall (186-meter-tall) waterfall, plus the Columbia River Gorge National Scenic Area, including Latourell Falls and Bridal Veil Falls. All entrance fees, plus a Portland hotel pickup and drop-off are included. Quality and quantity collide at Silver Falls State Park in Sublimity, Oregon, where the 7.2-mile long Trail of Ten Falls takes you past 10 amazing waterfalls in a row. The trail may be most famous for South Falls, a tall cascade whose unique position allows you to walk directly behind the waterfall for a look at the side less seen. 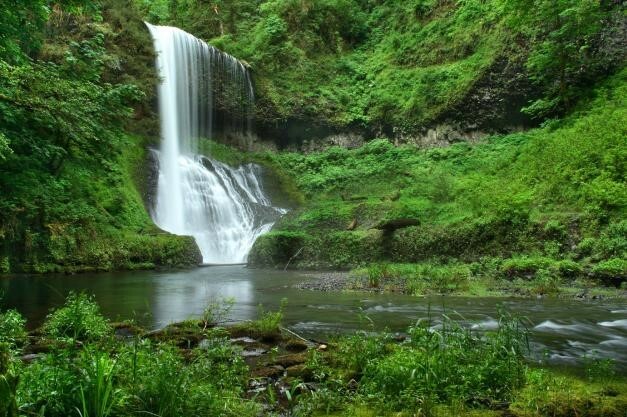 Tack the trip onto your Portland itinerary by joining a guided day trip to Silver Falls from Portland. Known as the “Niagara of the South,” Cumberland Falls in Corbin, Kentucky is a 125-foot wide vail of gushing blue-green water in Cumberland Falls State Resort Park. 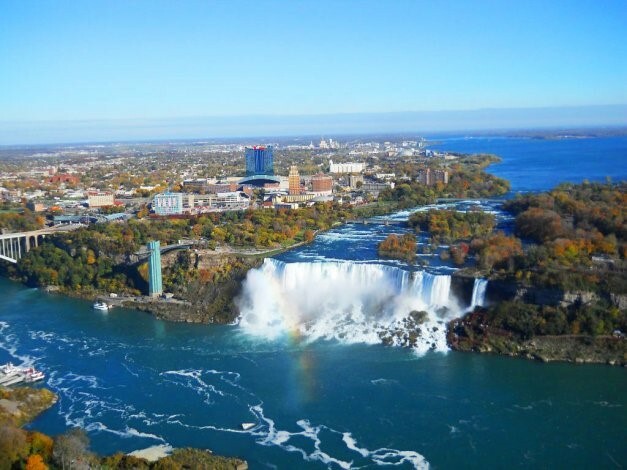 The falls are easily accessed from a pair of viewing platforms located right off the highway, but hiking trails give you the option to make a full day of the visit. 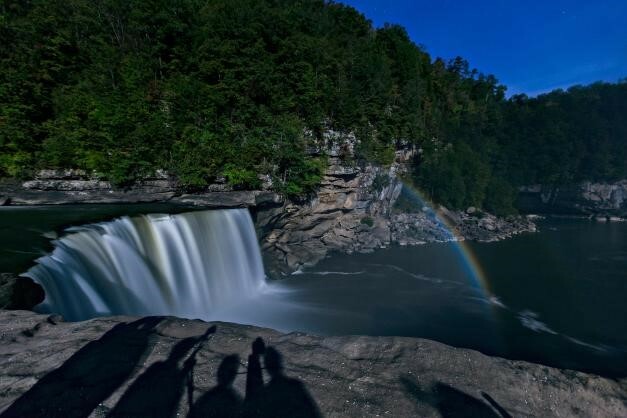 Plan your trip on a full moon for the chance to see a moon bow, a rainbow caused from the strength of the light reflecting off the falls and the full moon. A 20th-century stone bridge strung between two cliffs offers the best views of Multnomah Falls, one of the most famous waterfalls in all of Oregon. Stand on the bridge to admire views of the 542-foot tall upper tier and 69-foot tall lower tier from a single vantage point, providing a contrast that puts the falls’ sheer size into perspective. 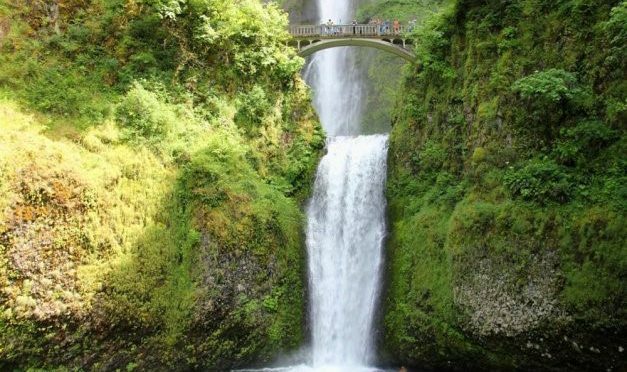 See the falls on their own, or combine with a trip to the historic Multnomah Falls Lodge. The falls make an ideal Portland day trip when combined with other Columbia River Gorge attractions. With PDX shuttle airport Visit the beautiful Columbia River Gorge! Your adventure will take place along the Historic Columbia River National Scenic Byway, where some of the locations we may stop include: Portland Women’s Forum, Crown Point Vista House, Latourell Falls, Multnomah Falls, and Shepperd’s Dell. You tour will start with the view from Portland Women’s Forum. This location is absolutely breathtaking and it’s one of the best spots to soak in a view of one of the most beautiful places on earth: the magnificent, awesome Columbia River Gorge. Next, PDX shuttle airport will stop at Crown Visit Point House with a complete overlook of the Gorge region. Crown Point Vista House, best known of the scenic lookouts along the Historic Columbia River Highway, provides a panoramic view of the Columbia River. The Crown Point Vista House was built in 1916 and refurbished and completely remodeled in 2005. Our next stop is Latourell Falls. This waterfall plunges 249′ over a massive wall of columnar basalt, some of the best formations in the Pacific Northwest, before cascading hastily toward the Columbia River. This waterfall is usually most recognized for the large patch of bright yellow lichen adorning the cliff face to the right of the falls, and this characteristic has led many famous photographers to this captivating location. Sheppherd’s Dell- In 1915, a local dairy farmer named George Shepperd gave all that he had (this tract of land) to the City of Portland as a memorial to his wife. The upper fall is around 42′ tall. The lower tier is around 50′ tall. Bridal Veil Falls- Beautiful Bridal Veil Falls is an elegant and graceful lady that can be fully appreciated from the deck of a viewing platform rebuilt in 1996. The creek hustles down from the top of nearby Larch Mountain, tumbles over the cliff and eventually flows into the mighty Columbia River. Next we will drive to Multnomah Falls. According to Native American lore, Multnomah Falls was created to win the heart of a young princess who wanted a hidden place to bathe. Multnomah Falls is the most visited natural recreation site in the Pacific Northwest with more than 2 million stopping by each year to take in the views! Fed by underground springs from Larch Mountain, the flow over the falls varies, but is usually highest during winter and spring. This is also one of the best places in the Columbia River Gorge National Scenic Area to study geology exposed by floods. Return to Portland and drop off at downtown Portland hotels. 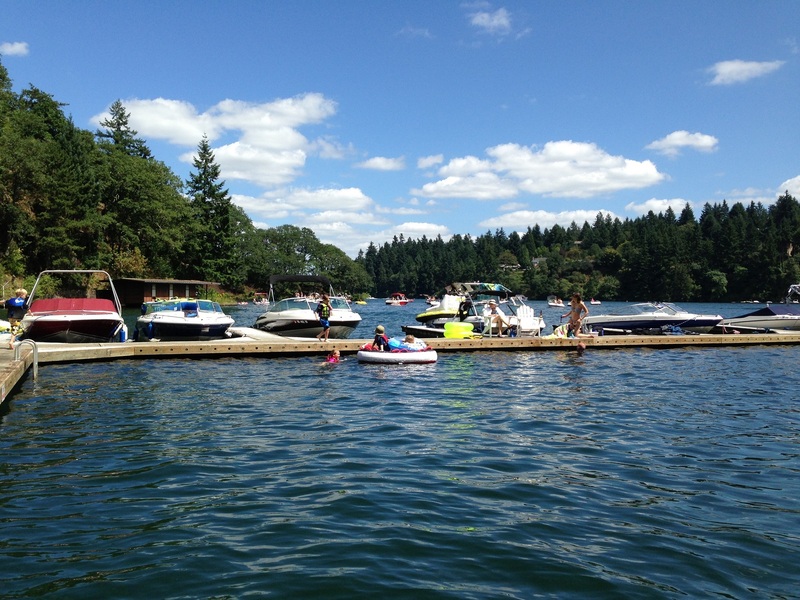 Lake Oswego /ɒsˈwiːɡoʊ/ is a city in the State of Oregon, primarily in Clackamas County with small portions extending into neighboring Multnomah and Washington counties. Located south of Portland surrounding the 405-acre (1.64 km2) Oswego Lake, the town was founded in 1847 and incorporated as Oswego in 1910. All of this place in your hand with Lake Oswego to pdx shuttle. The city was the hub of Oregon’s brief iron industry in the late 19th century and is today an affluent suburb of Portland. As of the 2010 census, the city had a total population of 36,619, a 3.8% increase over the 2000 population of 35,278. 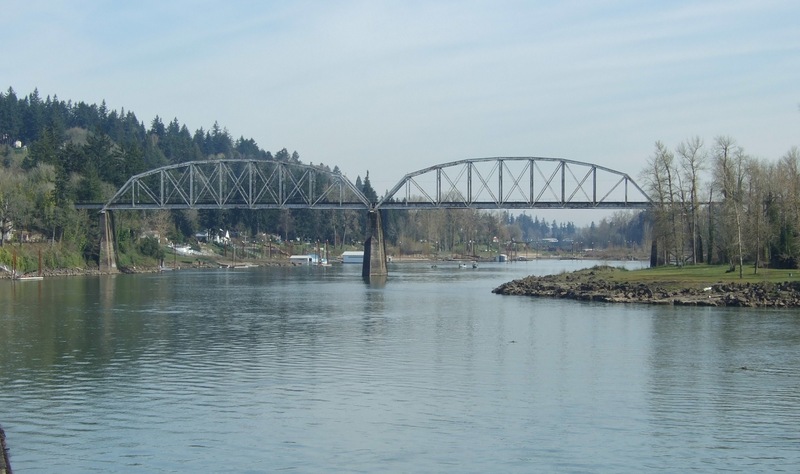 The Clackamas Indians once occupied the land that later became Lake Oswego. but diseases transmitted by European explorers and traders killed most of the natives. Before the influx of non-native people via the Oregon Trail, the area between the Willamette River and Tualatin River had a scattering of early pioneer homesteads and farms. The Lake Oswego Transportation System includes more than 178 miles of streets, 26 traffic signals, 12.0 miles of pedestrian pathways, and shared ownership of the Jefferson Street Rail Line within the city limits. The streets are classified as major and minor arterials, major collectors, neighborhood collectors, and local residential streets and traffic counts are available on line, all of them are very familiars for PDX shuttle airport driver because we have more than 50 customer in month that use Lake Oswego to pdx shuttle . Traffic management is a function of the City Public Works, Engineering Department. Functions include the Willamette Shore Trolley, Pathways, assisting the Transportation Advisory Board, the Traffic Counts Program, as well as general transportation related issues. Concerns, comments and questions regarding traffic related matters can be sent to [email protected] If you have a technical question a staff person will respond. Make sure to include your contact information if you would like a response. For more information, please contact the Engineering Division at 503-635-0270. You may contact others in the division by locating them in our staff directory. Local and regional events held in the Portland Metro Region will be posted here as a courtesy for public information only. The listing of events or links to websites do not imply endorsement by the City of Lake Oswego. Specific questions regarding any content should be directed to the appropriate organization. These objectives have been partially met by installing traffic management devices such as speed bumps, traffic circles, and diverters on local streets. To date, approximately 50 speed bumps, one diverter, one traffic circle, and one street closure have been utilized to calm neighborhood traffic. The eight-member Transportation Advisory Board oversees the program. Other tools the City uses include selective police enforcement and education. The education component was developed to increase citizen involvement in addressing speeding concerns in their neighborhoods. The program, which commenced in March of 1997, contains two main elements: Neighborhood Speed Watch and placement of LOPD’s Speed Reader.